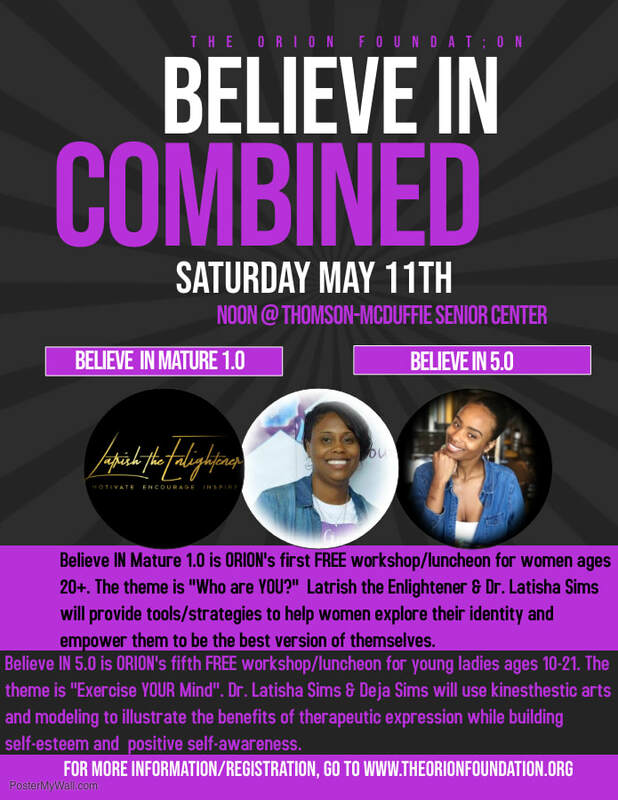 Believe IN Mature 1.0 is ORION's first FREE workshop/luncheon for women ages 20+. The theme is "Who are YOU?" Latrish the Enlightener & Dr. Latisha Sims will provide tools/strategies to help women explore their identity and empower them to be the best version of themselves. Believe IN 5.0 is ORION's fifth FREE workshop/luncheon for young ladies ages 10-21. The theme is "Exercise YOUR Mind". Dr. Latisha Sims & Deja Sims will use kinesthetic arts and modeling to illustrate the benefits of therapeutic expression while building self-esteem and positive self-awareness.